The Ambassadors of France, Palestine and Uganda paid a courtesy call on Minister of Foreign Affairs Abdulla Shahid, on Sunday. Ambassadors Eric Lavertu of France, Walid A.M. Abu Ali of Palestine, and Dinah Grace Akello of Uganda, held separate meetings at the ministry, during which Minister Shahid conveyed his felicitations on their recent appointments. 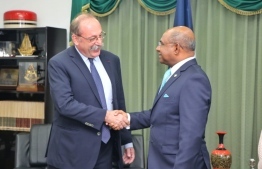 During the meeting, the minister expressed hope that relations between Maldives and France would be strengthened under the ambassador’s tenure. 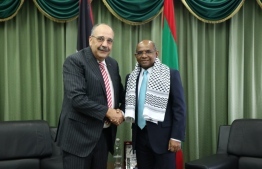 Additionally, at the meeting with Ambassador Ali, Shahid stated his hopes for Maldives and Palestine to continue to enhance the already existing bilateral bonds of solidarity and mutual cooperation. The Ugandan Ambassador assured the government of her eagerness and commitment to work together, in order to further strengthen ties between the two countries. Ambassador Akella and Shahid noted areas of economic cooperation and asserted their commitment to expanding bilateral ties between the nations. The Minister of Foreign Affairs was accompanied by State Minister Ahmed Khaleel, Foreign Secretary Abdul Ghafoor Mohamed, Additional Secretary Ahmed Shiaan, and Director Shiuneen Rasheed during the meeting with the French ambassador.